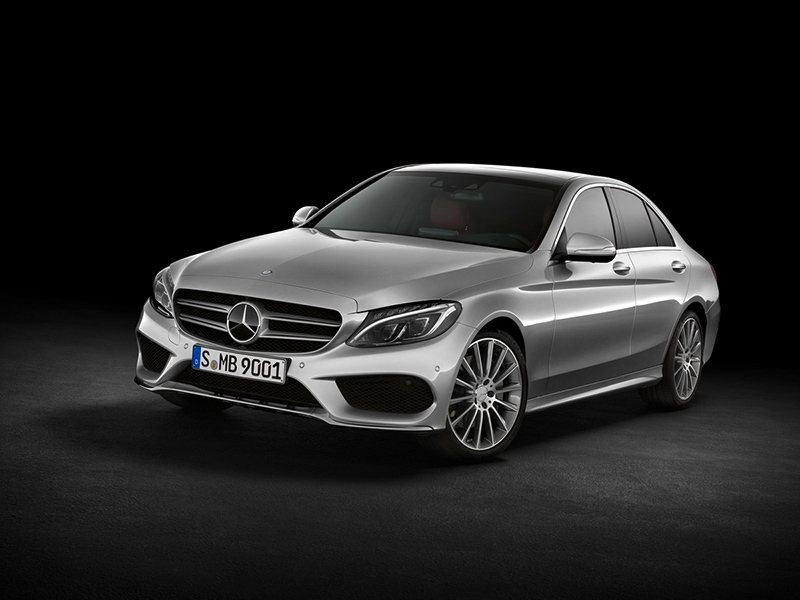 The all-new 2015 Mercedes-Benz C-Class heralds a new chapter in the Mercedes-Benz success story and sets new standards in the premium mid-range class. 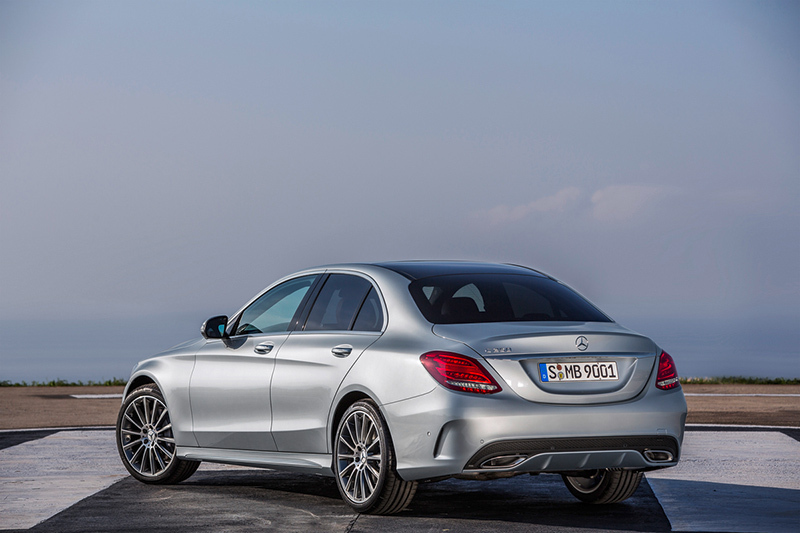 The C-Class is the top-selling model series from Mercedes-Benz. Sales of the preceding model, which was launched in 2007, total over 2.4 million worldwide. The new C-Class offers sensuous and clear design and a host of technical innovations as well as a comprehensive scope of standard equipment and exemplary emission and fuel consumption values. 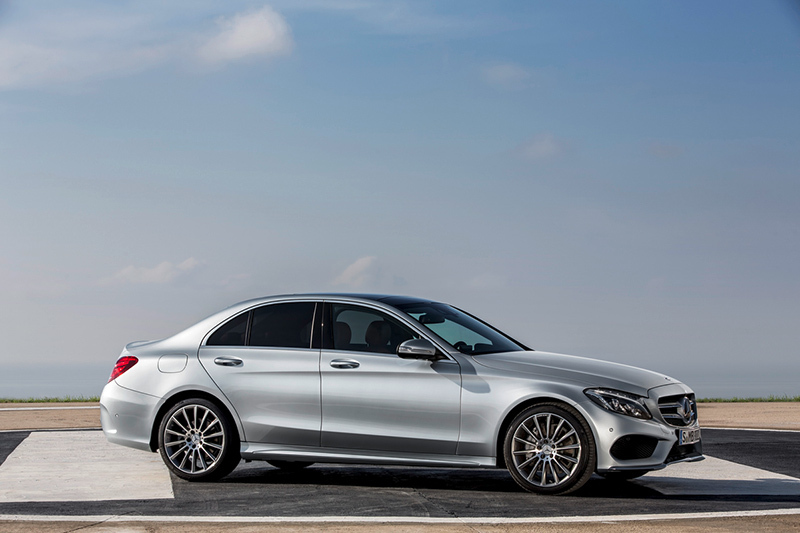 The U.S. market launches with two C-Class models: C300 4MATIC with a 2.0L turbocharged direct-injection in-line four-cylinder engine delivering 241 hp and 273 lb-ft of torque and a C400 4MATIC with a 3.0L V6 naturally aspirated engine producing 329 hp and 354 lb-ft of torque. A rear-wheel drive version of the C300 will be launched in the first quarter of 2015. The C-Class has grown to take account of people’s increasing average height. With a 3 inch increase in the wheelbase (112 inches) compared with the previous model, the vehicle is 3.7 inches longer (184 inches) and 1.6 inches wider (71 inches). The additional space benefits first and foremost the rear passengers, who now travel in even greater comfort. The new C-Class trunk capacity is 12.8 cubic feet. There is a choice of two different faces: sporty with centrally positioned star or the classic sedan radiator grille featuring the Mercedes star on the hood (part of the optional Luxury Package in the US). The fins of the radiator grille can be closed completely to optimize the vehicle’s Cd value, highlighting the status of this cultivated sedan in duly self-assured style. The new C-Class comes with H7 halogen headlamps as standard. The characteristic night design lends the new C-Class its very own distinctive look in the dark, too. The rear lamp and brake light in the tail lights feature LED technology in all headlamp versions. LED Headlights are part of the Premium Package, also featuring full-LED taillights. The interior design demonstrates a bold new approach by Mercedes-Benz. Here the designers combine in accomplished style the architecture of Mercedes-Benz sports cars with a totally new center console featuring flowing lines. A large one-piece center console panel performs an elegant sweep from the center air vents to the armrest. These seamless clear-cut lines create a sense of open space and convey a thrillingly purist and modern feel. A centrally positioned free-standing central display is the main eye-catching feature across the center console – with a screen diagonal of 7 inches or 8.4 inches if Multimedia Package with the COMAND Infotainment System is selected. 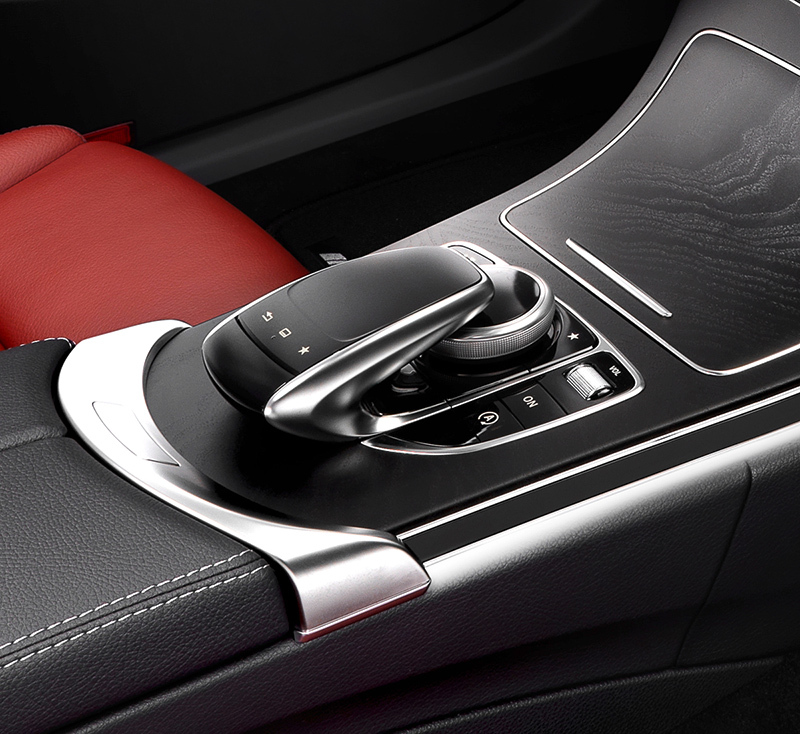 Five round air vents lend the dashboard a sporty touch. With their metallic cool-touch effect they create a fascinating, tangible contrast to the warm look of the other materials – such as the wood in the center console or the MB-TEX on the dashboard. The “upgrade” feel duly continues with the controls. All switches feature a high-quality, three-dimensional design befitting a luxury vehicle and benefit from a clear layout. The body-in-white of the new C-Class provides an innovative basis for reduced weight, outstanding rigidity, including introduction rigidity for excellent handling, combined with optimum noise and vibration characteristics and a high level of crash safety. Thanks to intelligent and innovative lightweight construction, the aluminum hybrid body is around 154 lbs lighter than a conventional steel body. The vehicle’s overall weight is even reduced by around 200 lbs. This spawns numerous benefits: the lightweight construction of the new C-Class cuts fuel consumption considerably without any loss of performance, while at the same time enabling a lower center of gravity, which in turn gives rise to the vehicle’s noticeably sporty and agile handling. Low drag is crucial to achieving outstanding efficiency. From a speed of just under 43 mph, aerodynamic drag exceeds the sum total of all other driving resistance factors. As such, drag constitutes a major parameter in efforts to reduce fuel consumption and CO2 emissions. The wind noise level, which was already low in the preceding generation of the C-Class, has been lowered further. A newly designed 4-link front axle plays a major part in the agile handling characteristics. Thanks to the 4-link principle, the front independent suspension is fully decoupled from the spring strut. The resultant favorable axle kinematics allow for more grip and higher lateral stability. As a result, the suspension responds more sensitively to steering movements and allows a sporty, agile driving style. An optimized multi-link independent rear suspension with 5-link concept ensures unsurpassed wheel location qualities and supreme straight-line stability. The new C-Class also comes with an electric parking brake as standard. All models of the C-Class family will feature the electromechanical Direct Steer system as standard. This combines road-speed-dependent power assistance from the speed-sensitive power steering system with a steering ratio which varies according to the given steering angle. The power steering assistance provided by the rack and pinion steering gear is controlled on-demand, thereby contributing towards efficiency. The new C-Class offers numerous innovative safety and assistance systems. It is fitted as standard with ATTENTION ASSIST, which can warn the driver of inattentiveness and drowsiness. On highways, the optional COMAND system navigation function flags up nearby break options as stopovers, providing the system has been specified in the vehicle. The ATTENTION ASSIST function offers an adjustable level of sensitivity and can inform the driver in a separate view in the instrument cluster about their level of drowsiness and how long they have been driving since their last break. The numerous assistance systems also includeActive Parking Assist, which enables automated parking with active steering and brake intervention in both parallel and end-on parking spaces. A completely new multimedia generation offers intuitive operation in the new C-Class, featuring elaborate animations and visual effects which present all the functions in a clear and highly attractive manner. The new C-Class is also equipped with the unique Frontbass system. This avant-garde acoustic system uses the space within the cross-member and side member in the body structure as a resonance chamber for the bass speakers to conjure up a listening experience almost on a par with a concert hall. A Burmester® surround sound system is optionally available. COMAND offers a larger display with a resolution of 960 x 540 pixels and a special bonded glass cover such as is familiar from consumer devices like the iPhone or iPad.